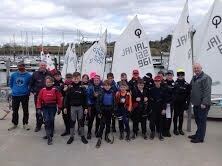 Sunday April 17th saw the first optimist competitive event of their season at RCYC, with the holding of the TCI / Curradinghy Trophy which was run on the bank. 18 Sailors in 6 teams of 3 ran off 15 races which was curtailed due to a lack of wind. All the teams were evenly matched and all teams won at least one race. It was a great experience for all the sailors and for some their first introduction to team racing. Thomas Chaix ran a professional event supported by a host of parents. The older and more experienced sailors were chosen as captains using the newbies as rabbits trying to get the best combinations of results as they raced against each of the other teams. The final flight pitted Team 1 (M Crosbie, L Bateman and S O Shaughnessy) against Team 6 (P Bruen, E Horgan and S Cunnane) to sort final honours and in a close result (nail-biting for those parents present) the former won through by 1 point! In 3rd Team 2 (Alfonso, A Keal and E Spillane) in 4th Team 4 (J Lucas, S Prichard, B O Shaughnessy) 5th Team 3 (J O Shaughnessy, K Horgan A Carroll) and 6th Team 5 (H Pritchard, J Venner,C McDonagh). Many thanks to all who helped out including Thomas and congratulations again to all who took part. We plan to run TR practice in the coming weeks on Saturdays before League racing. This Saturday sees the start of the April/May Saturday League. Rigged and ready for 1 pm after Darren’s Group are finished. 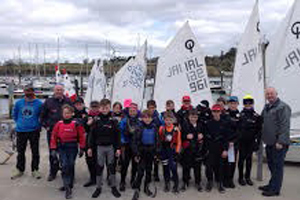 We would like to welcome the U12 National Squad for their weekends training at the RCYC who are beginning their preparations for the UK Nationals during the summer. I Understand Anthony McCann will be on hand with food afterwards for all. Available to be purchased in the dining room, Saturday after sailing. Finally, there will be a bring and buy in aid of the RNLI on Saturday morning at the club Green Room (from 10am onwards) so please bring any children’s sailing gear that isn’t needed as we hope there will be a lot of new sailors and their parents around who might be interested.